With Halloween officially 4 weeks away, it's time to start planning! Whether you're hosting a haunted house, throwing a spooky shindig or inviting a few friends over for a ghoulish good time, here is only the first of many Halloween treat ideas to tantalize and terrify your guests -- all gluten free, of course! Delicious peppermint hot chocolate with two marshmallow & Crows eyeballs peering back at you! 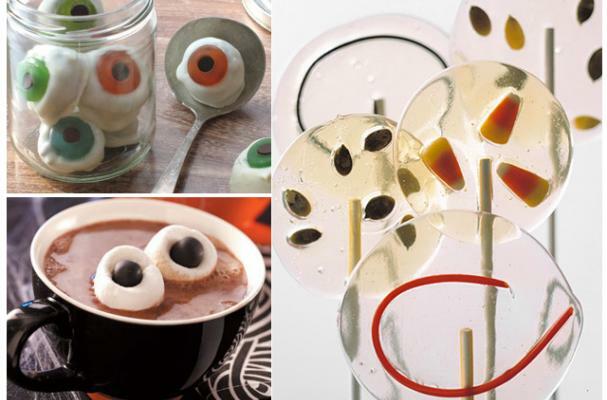 Create a clear candy disk and add Halloween treats to "float" above the lollipop stick! Try candy corn, toasted pumpkin seeds, black sesame seeds, etc. Crushed chocolate sandwich cookies (faux Oreos, if you will) mixed with softened cream cheese, covered in white chocolate and spookified with a gummy Lifesaver iris and chocolate chip pupil! Be sure to use gluten free cookies, of course!